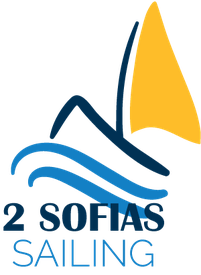 2 Sofias Sailing - 2-sofias-sailings Webseite! This is my webpage and blog documenting my journey! This is my second blog documenting my sailing trip for 3 months summer 2018. Since I have friends, family and relatives scattered across the world this blog is in English, even if German and Swedish would be called for too. So feel free to comment in any of these languages! Summer 2014 I fulfilled a childhood dream sailing in the Stockholm archipelagos and Åland archipelagos from June till August, 13 weeks. My blog from then Stockholm archipelago I'm coming shows where and with whom I traveled and experienced great things. I have secured the S/Y Bavaria 37 called S/Y Sofia II with the home harbor Bullandö for a good price for 13 weeks. So two Sofias will sail together! Are you interested to come along sailing? Summer 2014 I did not have so much experience skippering a sailboat, even if I gained my Swiss yacht master May 2009, so the main goal was for me to finance the boat myself and have great company on it and mingle friends from work, private life, Germany, Sweden, Switzerland and family coming along even from Australia and letting them getting to know each other on the boat, the connection to all are over me getting to know each other across the world. The whole trip summer 2014, with a few setbacks, was a success both sailing wise as well as friendship wise! Well, after 2014, it was clear to me I want to take 3 months off again to go sailing in Sweden. Now this is about to come true by taking 3 months sabbatical summer 2018, also from June to August, 13 weeks. The planning phase is now over and I start sailing Sunday 3rd of June. I will go from the east coast of Sweden sailing in the archipelagos of the Baltic see to the west coast bordering the north sea with completely different rougher archipelagos and then round south of Sweden and return up along the east coast exploring all the archipelagos south of Stockholm returning back to Bullandö , see the map below with the calendar weeks. CW stands for calendar week, so each dot marks the start of each sailing week on a Saturday. Go south along the archipelagos to enter the Göta kanal with total of 58 docks and cross through to the big lakes Vättern och Vänern. 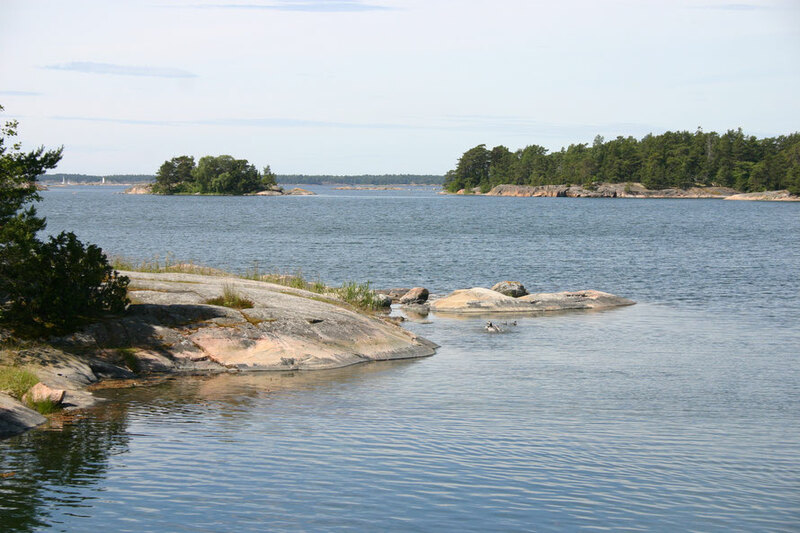 In the lake of Vänern we would also celebrate Swedish midsommar on friday the 22nd of June. 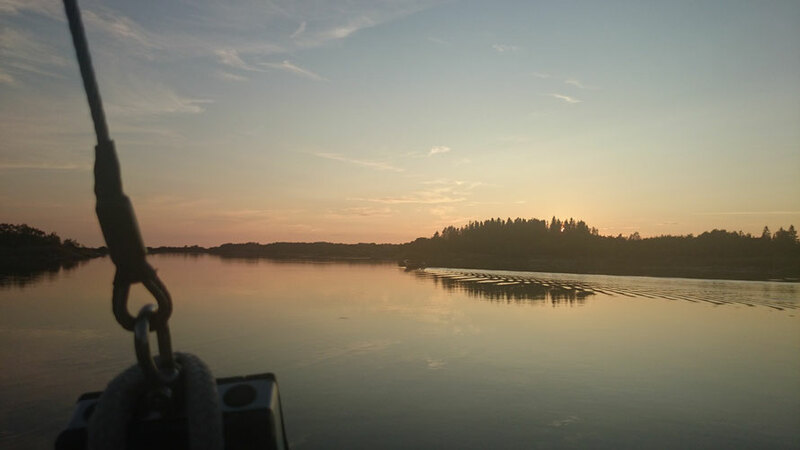 Then the last week of June we would spend a few more days in the big lake of Vänern and take Trollhätte kanal with 6 docks to Göteborg and probably do a crew change north or Göteborg in Marstrand. 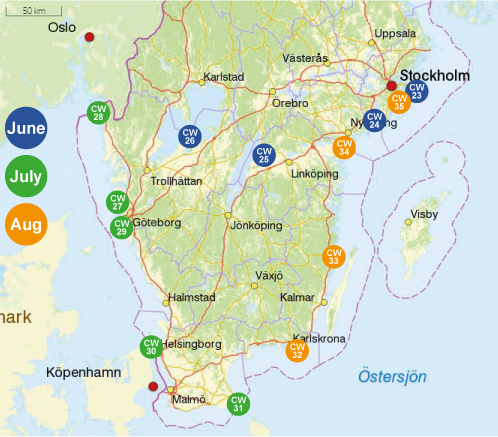 From Göteborg or Marstrand on the west coast we would head north towards Norway, perhaps even end up in Oslo? If not at least go to the most northern harbor of Sweden, Stömstad, on the west coast and then start heading south back to Göteborg and even pass by Köpenhamn. Here there will be no more small archipelago islands anymore rather great white sand beaches. Therefore I would like to do a few longer days sailing south of the Swedish along the coast, perhaps if the weather permits visiting Bornholm, that is the most eastern island of Denmark. On my birthday the 30th of July we should be in Åhus, so my sister can join us celebrating on the boat. On Åhus beaches, I have experienced the most powdery sand that squeaks when you walk, amazing! From here the archipelagos start again while heading east along the south coast of Karlskrona, the big maritime military town of Sweden. Then continuing up north the east coast past Kalmar, with the great castle, between the coast and Öland and back towards Stockholm. Mid August the crayfish party, kräftskiva, season starts and we will head by my dear friend Camillas yellow summerhouse in Uttervik and celebrate with her and her family. From there we will head back towards Stockholm through all the beautiful archipelago towards Bullandö. I am the captain, Sofia. Summer 2018 I am doing my second 13 week long sailing with friends, family and sailing acquaintances together in Sweden. 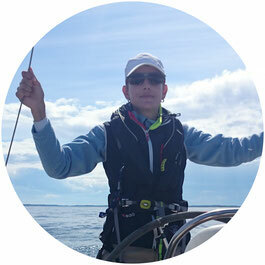 Since May 2009 I have my Swiss sailing yacht master and I have been sailing since I was a child. This a second dream coming true!